Despite the reduction of floats and artist performances, due to the lack of financial support from Rio's government, more than 800,000 attended. 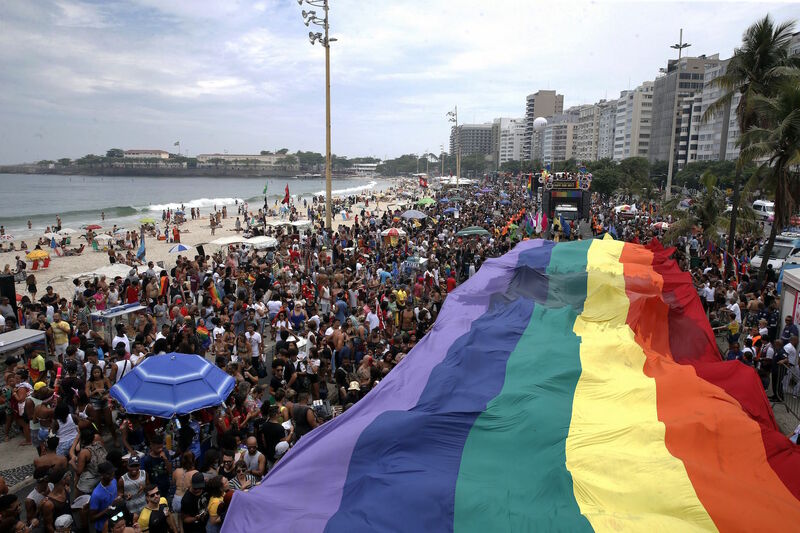 SÃO PAULO, BRAZIL – More than 800,000 flocked to Copacabana Beach on Sunday to celebrate the 22nd edition of the LGBT Pride Parade, despite the lack of financial support from the city, according to organizers. Rio’s 22nd Gay Pride Parade attracted thousands to Copacabana Beach, photo by Tânia Rêgo/Agência Brasil. This is the first time in fifteen years the city has not financially helped the parade, making many protest against the current mayor, Marcelo Crivella. “Carioca society is libertarian. It does not suit the mayor you have,” shouted Daniela Mercury, one of Brazil’s most well known artists, as she entertained parade-goers from the top of a float. With the slogan ‘Resisting LGBTI phobia, fundamentalism, all forms of oppression and in defense of Rio’, organizers called on people ‘who fight for equal rights, who fight intolerance, prejudice and hatred, giving voice to those who lived a long time in the margins of society’ to attend the parade. “Historically, we are a resistance. Brazil does not have a de facto public policy for the LGBT population. Homophobia is a fact. Virtually every day a homosexual victim of homophobia dies in the country. If we exist, in some way, it is a resistance,” Almir França, president of the Arco-Iris (Rainbow) Group, and organizer of the event told government news agency, Agencia Brasil. According to the organizers, in past years the city of Rio de Janeiro had given the parade between R$350,000 and R$400,000 to help host the event. This year, without the government’s help, organizers had to reduce the number of floats from ten to three and artists performed for free. In addition to criticizing Crivella and calling for equal rights among all, parade-goers also criticized the so-called gay-cure, or conversion therapy, authorized by Brazilian courts in September.